Hula Juice Bar is so much more than a juice bar! It is a great, vibrant cafe with a range of superb healthy food, smoothies and cakes that is just very good for gluten free dining. 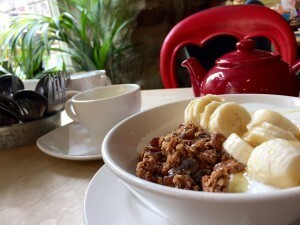 Based in the Grassmarket in Edinburgh, Hula is one of the buzzing little places in the area that is good for breakfast, quick dining or takeaway and which gives the Grassmarket a real vibe. I visited on a Saturday when the market was beginning to wake up, with stalls going up and tourists coming out of the hotels to see what was going on. But when I got to Hula Juice Bar it was really jumping! Lots of people having unusual and brilliant breakfasts, chat and cheeriness all around. 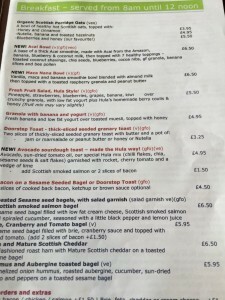 The service is really friendly and helpful and the menu clear with its gluten free options. There are some good alternative and healthy breakfasts on offer. Next to me someone was enjoying sourdough (the gluten version) with avocado, sun-dried tomato oil, chilli, rocket and lime. And according to the menu (see below) you can have this in a gluten free version. This is a pretty delicious and virtuous breakfast by the look of it. I went straight for my favourite, which is granola. Served with fresh banana, low fat yoghurt and honey, this is a really filling bowlful and completely delicious. The granola had a crunch to it and was packed with nuts and seeds, the banana was not gassy (v important!) and the yoghurt and honey were smooth and tasty. With a cup of fresh peppermint tea I was really well set up for the day. I resisted the cakes, which was hard as there was a great selection of gluten free goodies. This place really knows how to keep the gluten avoiders happy, while also catering for the mainstream of healthy hungry customers. I just love it and will be back. My husband has just started working nearby and it is already his favourite lunch spot when he tells me it as buzzing as it was on a Saturday morning. Maybe you will have to wait to get a seat at busy times, but it is definitely worth it!